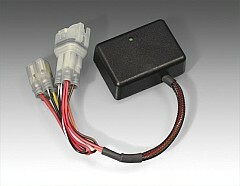 The Online Shop for Dynojet Power Commander Accessoires. At some motorcycles, you have to disconnect the O2 Sensor cable so that the engine electronics accepted the revised values from Power Commander and the performance can be increased. To avoid an error code from your engine ECU you have to fit this controller. The controller is a small electronics which send to the engine control unit a flexible value and not just a constant value like the O2 Sensor eliminator. « back to overview "Power Commander Accessoires O2 Sensor Controller"